The Arizona Game and Fish Department has been actively involved in reintroducing Mexican wolves to portions of their historical range since before the first release of wolves in 1998. In the 1980s, the recovery effort focused mainly on involving the public in discussions about reintroducing the Mexican wolf. 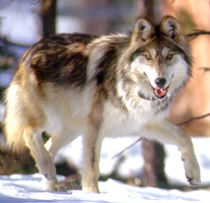 Management activities during the 1990s included public opinion surveys, public meetings, site feasibility studies and surveys for areas that would support naturally-occurring wolves. In addition, there was intensive coordination with cooperating agencies, including the U.S. Fish and Wildlife Service (FWS), New Mexico Department of Game and Fish and the U.S. Forest Service. As a result of these activities and a federal mandate from the Endangered Species Act of 1973, a FWS decision was made to release captive Mexican wolves in east-central Arizona. In 1998, 11 captive-reared Mexican wolves were released into the Blue Range Wolf Recovery Area (BRWRA) in eastern Arizona. Additional releases have occurred since the initial release. With the birth of the first wild-born litter from a wild-born parent in 2002, the Mexican Wolf reintroduction project entered into a new phase, whereby natural reproduction began to replace the need to release captive-reared wolves. In 1976, the U.S. 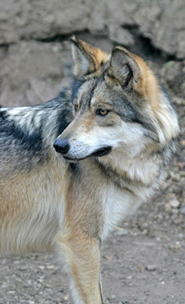 Fish and Wildlife Service listed the Mexican wolf as an endangered species. The Mexican wolf is an endangered-species rarity in that its major recovery needs are not habitat management and restoration. Rather, social tolerance is the primary recovery challenge. The department works to address stakeholder concerns and achieve a balance between those that live, work and recreate in areas shared with the wolf and the need to facilitate a self-sustaining population no longer in danger of extinction. Education and outreach remains a critical component of the Mexican wolf recovery effort. Mexican wolves had once disappeared completely from Arizona and New Mexico. By the end of 2016, surveys counted at least 113 Mexican wolves in the wild in Arizona and New Mexico. The number reflects only those animals that were visually seen, undoubtedly a few more exist that were not counted. More than 250 additional wolves are being held in various captive-breeding facilities located throughout the United States and Mexico. Mexican Wolf restoration is a cooperative effort between five co-lead agencies: Arizona Game and Fish Department, White Mountain Apache Tribe, U.S. Animal and Plant Health Inspection Service – Wildlife Services, U.S. Forest Service and U.S. Fish and Wildlife Service. Interagency Field Team: An Interagency Field Team (IFT) carries out on-the-ground activities for the Mexican Wolf recovery. The Arizona Game and Fish Department currently funds five full-time biologist positions and is the primary agency conducting day-to-day management of the wolves in Arizona. Field team members are agency employees, interns or volunteers. Team positions include field team leaders (one per state and tribal lead agency); wildlife biologists and specialists; depredation specialists; conservation education and outreach specialists; field assistants; and, other staff as the lead agencies and cooperators may deem appropriate and necessary.